Smile of Joy aims to give each HIV infected and/or affected orphaned and vulnerable child in South Africa the foundation for total oral health. Frederico was one of the children in South Africa that got lost in the masses. He was born with HIV and has been living with the virus for approximately 6 to seven years (his mother doesn’t know his exact birth date), without anyone knowing, when we met him. Living in a shack with his mother, being a prostitute in the area, he was severely ill with constant airway infections (being identified to be TB at a later stage) and severe diarrhea according to the headmaster of the school he was attending. It was during our annual dental screening visit to one of the institutions that we did the screening at the different schools the children attended. The headmaster of Frederico's school requested we have a look at some of the other orphans and vulnerable children attending his school who are not part of the specific orphanage program we worked with. And that was how we met Frederico... what a life changing experience. The findings in his mouth were horrific and we immediately knew he was most probably HIV positive. At that stage he had four draining dental abscesses; active caries in each and every tooth; wide spread Pseudomembraneous Candidiasis; multiple ulcers; dried chapped lips and Angular Cheilitis. Apart from all of this, he had a severe fever, a bad cough and was very weak. We immediately informed the institutions' social worker and that same afternoon we met with the mother, begging her to take Frederico to the clinic for examination. Sadly the mother denied that there is anything wrong with the child and just took him home. After long negotiations with the mother, stretching over a period of two months, she eventually agreed that Frederico could be admitted to the institutions Hospice for intravenous antibiotics. Only after another month she gave concent to have him tested for HIV of which he was found to be positive. We could however not attend to his oral status before the child’s overall health was found to be stable. August 2007 we eventually had the opportunity to extract all his teeth under general anesthesia, and immediately afterwards treated him for systemic Candidiasis, he was still not on Anti Retro Viral medication. He has however been included in the institutions feeding scheme, receiving two decent warm meals everyday and being overwhelmed with love by all the other orphans in the program. Unfortunately by August 2008 he was still not on ARV treatment, for the mother still didn't accept the fact that her child needed the medication. Fortunately with two decent meals per day, a healthy mouth and all the love, Frederico gained weight, comparing to the loss of weight in the previous years. He even now knew how to smile… a real smile of joy! 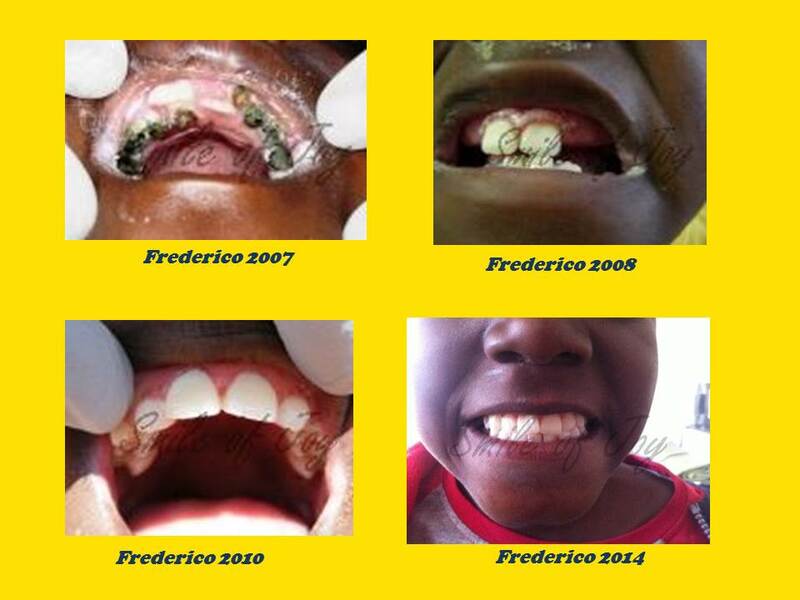 Frederico started with the ARV treatment in 2009 thanks to a wonderful social worker that didn't give up on him. Since then he has been in and out of hospital and ended in a children's hospice in 2011. The words of the hospice manager "a child was not designed to die" came to life when this little boy didn't give up. Currently he is reunited with his mother and a close eye is kept on his care at home. He is running around playing with the other kids, and his eyes are filled with a determined will to live! Frederico is one of many children that have been identified to be living with HIV just through an oral screening. Smile of Joy wants to assist in making a difference in these children’s lives. We want to teach the orphans and vulnerable children the importance of oral care and how to maintain a healthy oral cavity. Smile of Joy wants to contribute to the enhancement of the quality of life of children living with HIV/ Aids, help them to have a smile of joy!